GHTC does not own any land. The trails belong to both private and public landowners. They have granted a privilege to the Guelph Hiking Trail Club. In consideration of the landowners’ rights, and as responsible members of the Club, please adhere to the following Trail Users’ Code. 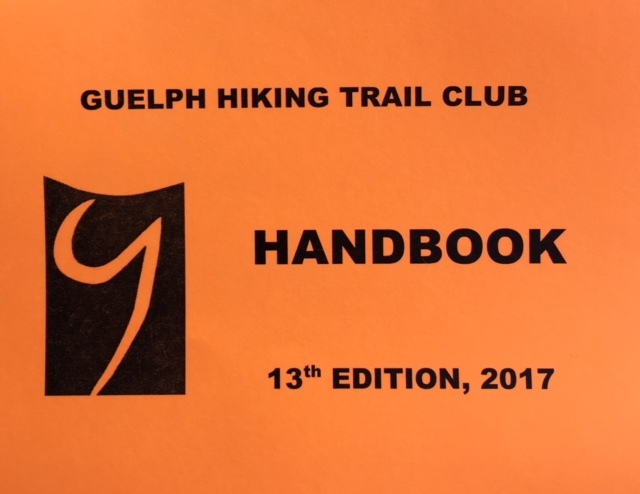 The Guelph Hiking Trail Club has established and maintains three main trails and their related side trails. The total length of these trails is, at present, approximately 80km. Kissing Bridge Trail-- is a multipurpose trail, following the former CPR Guelph-to-Goderich railway line from the northern end of Guelph to Millbank. The Guelph Hiking Trail Club, maintains the 13 km section between Guelph and the Grand River. This trail is suitable for hiking, biking, snow-shoeing and skiing. In addition, some sections are open to snowmobiles during the winter. Starkey Trail--a 4 km loop trail southeast of Guelph that is jointly maintained with the Grand River Conservation Authority. 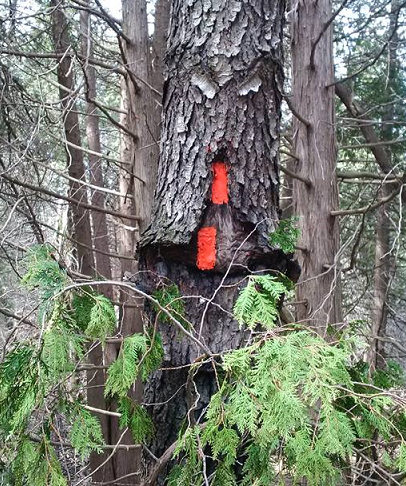 The Radial Line Trail and the Speed River Trail are marked by single orange paint blazes, approximately 15cm high by 5 cm wide, on trees, fence posts, stiles or rocks. Double blazes, one staggered above the other, indicate a change of direction. Side trails are blazed in blue. The Kissing Bridge Trailway is not blazed, as it follows and abandoned railway line on an obvious course. It is however, very well signed. The landowners who have kindly granted permission to the Club to establish trails on their properties. The small and dedicated group who originally formed the Guelph Hiking Trail Club and worked diligently to clear and blaze the Radial Line Trail; those who carried on and established the Speed River Trail and the Kissing Bridge Trailway; and those members who continue to maintain these trails. The many individuals and organizations who have donated funds which have enabled the Club to make capital improvements to our trails, including the Guelph Lions Club, the TD Canada Trust Friends of the Environment Foundation, the County of Wellington, the Regional Municipality of Waterloo and the Trillium Foundation. 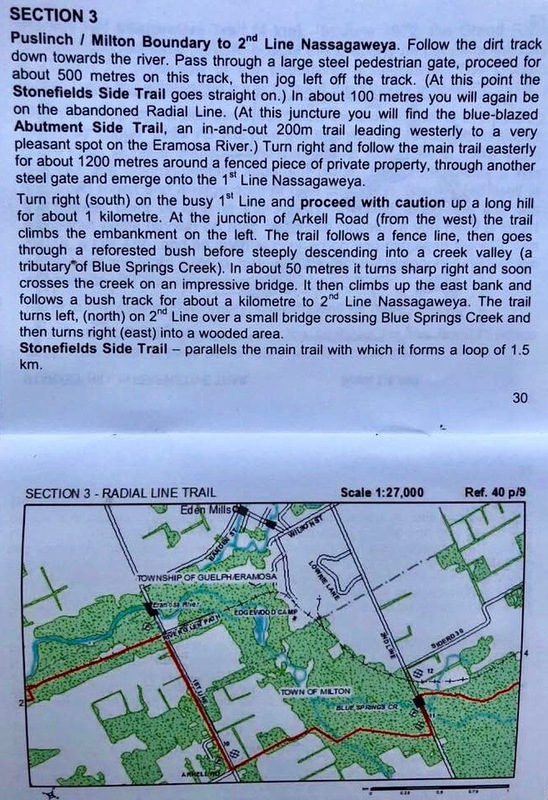 TRAIL MAPS Coloured trail maps are published in our Guelph Hiking Trail Club Handbook. It is not necessary to be a member to buy a Handbook, but membership fees help us keep these trails open. The cost for handbook is $15 for members and $20 for non-members. Use our on-line order processing. Click the Handbook image below to go to our store. Or mail a cheque, along with a Membership Form and indicate you are ordering the "Handbook with Trail Maps" and enclose funds.